A study of the characteristics of gold nuggets from around Australia has overturned many years of accepted scientific wisdom on how nuggets form. 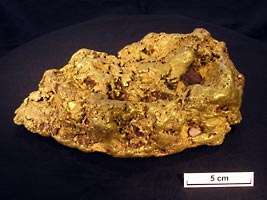 The research reveals the gold nuggets formed deep underground at high temperatures. “Previously it was assumed that gold nuggets formed in place, where they were found, either precipitated from fluids or grown from microbial action,” CSIRO’s Dr Rob Hough said. “But all of the gold nuggets we studied have a crystalline structure and silver content that shows they formed at high temperatures. Since these temperatures do not occur at the surface, the nuggets must have originated deep underground. A better understanding of how gold nuggets form will help explorers decide where to search for the precious metal. If the nuggets are not formed where they are found, but weathered from gold-rich ore, the original source may still be nearby. The researchers examined the external and internal characteristics of more than 30 nuggets from different locations in Western Australia, Queensland and Victoria, ranging from 1g to more than 8kg. The research could not have been conducted without the assistance of Western Australian philanthropist and mineral explorer, Mr Mark Creasy. “Mr Creasy donated more than a million dollars worth of gold nuggets for our research from a variety of sources around Australia. This is an extraordinarily valuable contribution toward furthering our understanding of gold nugget formation. Some of our activities, such as cutting an eight kilo gold nugget from Victoria in half, would simply not have been possible without his support,” Dr Hough said. The research was conducted in association with the Cooperative Research Centre for Landscape Environments and Mineral Exploration involving scientists from CSIRO Exploration and Mining and Curtin University of Technology. It was published this month in the Australian Journal of Earth Sciences.